Iranian protesters chant slogans at a rally in Tehran, Iran, Dec. 30, 2017. Iranian hard-liners rallied Saturday to support the country's supreme leader and clerically overseen government as spontaneous protests sparked by anger over the country's ailing economy roiled major cities in the Islamic Republic. Q: Let me start by asking, what is the implication of the protests in Iran to Washington's policy towards that country and to the region? What is the next step for the United States? Peek: "Well these protests are indicative of what the United States government has said all along. The biggest victim of the Iranian government are the Iranian people. We are watching the events extremely closely. We continue to support the Iranian people, the president has been very clear about that. We call on the Iranian government to respect the right of their people to protest peacefully, to respect the right of free-flow information and not to use violence against peaceful protesters. These are basic human rights we think they should uphold." Q: To follow up, what is the game plan of the U.S. to take the next step? Peek: "Absolutely, we continue to speak with our international partners and encourage them to highlight what is happening in Iran. This is a very different approach from 2009, the protests then. We want to make it clear now through visible and vocal support of the Iranian people, that we will not let them suffer anonymously, that when they want to exercise their basic human rights we will support them." Q: Has Secretary [of State Rex] Tillerson spoken with his counterparts in the region since the protests? Peek: "We are in touch with our counterparts, particularly in the European Union at an extremely senior level and we are working to build an international coalition to support the Iranian people." U.S. President Donald Trump arrives to board Air Force One to return to Washington at the conclusion on their holiday vacation, from Palm Beach International Airport in West Palm Beach, Florida, Jan. 1, 2018. Q: President [Donald] Trump has voiced his support to the protesters and people in Iran. How does the United States respond to calls and appeals to lift the travel ban which limits Iranians coming to the United States? Peek: "Well, the president has made it very clear that his support is with the Iranian people, I think all of us is. The travel restrictions are a measure imposed as an effort to limit some of Homeland Security vulnerabilities. And I think the United States continues to assess what the vulnerabilities and the best way you address them going forward." 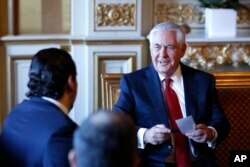 Lebanon's Prime Minister Saad Hariri, left, meets U.S. Secretary of State Rex Tillerson before a gathering of world diplomats in Paris, Dec. 8, 2017. Q: Earlier in June, Secretary Tillerson told the Congress he supports elements inside Iran that would lead to a peaceful transition of government, he said, "those elements are there, certainly as we know." Could you please elaborate what are those elements? Peek: "Sure, I think the secretary's statement speaks for itself. I'll tell you what we are thinking is a change in the Iranian government's behavior, particularly its destabilizing regional activities, its support of terrorism and also the way it treats its people internally. So we've been clear about wanting to support those changes, and will continue to do so." Q: About seven years ago, Syria's civil war began with protests, but was followed by attacks from the Syrian government. In your estimation, how likely will the protests in Iran evolve into the one that's similar in Syria? Peek: "Oh gosh, you know at this point it's way too early to tell where these protests are headed. You know, I think the protesters have legitimate grievances against their government and they should be heard. You know, the Iranian government should also listen to them, it should not respond by violently cracking down on people who are peacefully demonstrating. I want to say this from our part, we will hold accountable those people or entities who are committing violence, from the top to the bottom, against the protesters. That is not something that is going to happen in a vacuum, we're watching very closely, in the process of examining actions we can take against those individuals, like sanctions and other means." Q: So, you're saying that the next step is more sanctions against those who should be responsible to attack the protesters? Peek: "We're considering a variety of options to hold those people accountable, including sanctions." Q: Could you please elaborate a little bit more on that? Peek: "No, I don't want to get too much into kind of the operational detail here. There are a range of measures, including sanctions, that we can use to take action against those who commit violence against the protesters." Q: You mentioned, I would like to touch on the protests in 2009. Could you please compare the latest protest with those in 2009? Peek: "Yeah, certainly, there are some differences, at least what we have seen reported. I think largely there is a lot of similarities though, you know, these protests were born out of some of the same elements in 2009. The fact that the Iranian people seek greater freedoms that are economic opportunities and like a movement bubbling below the surface, it sprouts up occasionally and while the form may occasionally be different, there's these protesters sparked by one thing, those protesters sparked by another. It all is a horrific (sic) of this underlying current of discontent in Iranian society because of the limited opportunities and the restriction that the Iranian government places on its people." Q: Regarding actions from the United States. What's the difference between now and then, those measures taken by the United States government? Peek: "I think you've seen the vast difference in the way that we are handling this. This time there is vocal and immediate support for the people Iranians who are protesting, that wasn't in 2009. This is a whole of government support, including Secretary Tillerson, and the president and other officials. I think we are also aggressively working to amplify messages of support from our partners, including the Canadians, the British, the Germans and others, the French, the Italians. To ensure that the Iranian people are able to express their discontent. As I mentioned, we're also looking at other options of how to hold those regime elements that would crack down, potentially on these protestors, accountable." Q: Besides the coordination with the allies in Europe, how about those in the Middle Eastern — leaders in the Middle Eastern region? Q: Has Secretary Tillerson spoken with his counterpart in Saudi Arabia? Peek: "I know we are in touch at staff level, I am not sure if the secretary has spoken with his counterpart in Saudi Arabia. No, I don't believe so in fact."